composting site, was held a special presentation of the Big Hanna composter model T240 used for food waste composting on downtown Montreal campus. Vertal inc., North American distributor of Big Hanna composters, received upon invitation representatives of environmental organizations to demonstrate the operation of the composting site at McGill University. The demonstration of the composter’s daily operations is explained in detail including introduction of food waste in the composter. Guests were able to see the simplicity of operations management, observe and touch the composting biological process in both the heart and at the exit of the composter. Also, the computer controlling the composting process allowed a clear interpretation of the control parameter’s adjustment based on data collected in the composter. 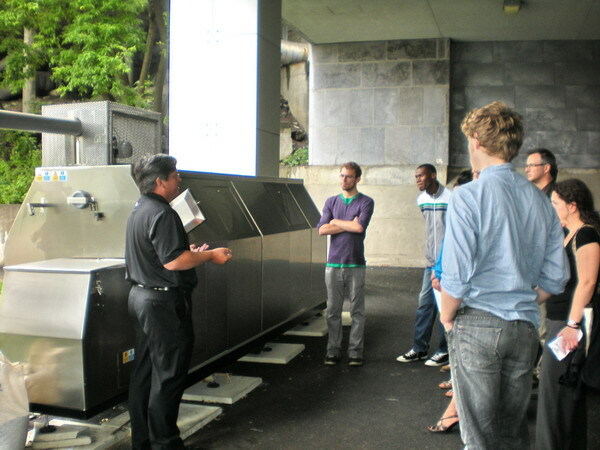 The McGill University composting site, located in the heart of campus in downtown Montreal, requires a comprehensive and effective management of odors. The biofilter connected to the composter allows total control of air emissions on campus. Seen here, Mr Claude Beaulé, Vice-President of Vertal inc. is explaining the composting process operations to the guests. Major comments following the presentation expressed that it is possible to have a clean and odorless composting site in a densely populated urban environment and the space required for effective management of food waste is modest considering the massive amount of organic material processed, in this case between 60 and 100 tons annually.